Laval, ?anada - September 23, 2015: Drone Flying At Sunset over an onions field. The drone is a Yuneec Typhoon Q500+ equipped with a 4k camera. The tech industry is always about the latests trends and the coolest gadgets. And for farmers, it's even better when that technology can be used to make them better at their jobs. 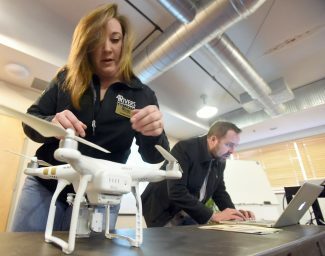 At the Colorado Farm show on Jan. 26 at Island Grove Regional Park in Greeley, Colo., producers had a chance to learn more about how drones can help them with precision agriculture. Precision ag is the ability to make the most of everything utilized in growing crops. It offers answers to questions such as: Where is the best place to put more seeds? Where is fertilizer most needed? Where can farmers water less? And drone technology is helping with that. Jason Barton, vice president of sales for Agribotix, a data processing company for agriculture, talked to a crowd of about 30, about how drone technology can be used in precision agriculture. The basics come down to drones flying over the land and taking infrared photos, which then can be accessed using an application from a smart phone or tablet to show how crops are doing. The infrared shows which crops are healthy and which aren't. The photos also allow farmers to determine where fertilizer is useful and what type will help the crops more, Barton said. There's also a multi-year dimension to the technology, which allows farmers to see trouble areas in their fields and pastures. This is important in precision ag as it can tell a farmer to avoid putting seed in places where a crop won't grow. This means less money will be spent where there likely won't be profit. 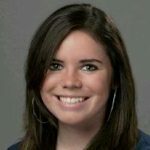 Using GPS, the app FarmLens lets farmers take notes and pictures of their field, which will then be pinpointed to the infrared photos. This can be useful to better understand how to make certain areas better for crop production. The use of a drone also can help show how weather affects the crop. For example, in large fields of wheat, it can be hard on foot to access damage after a hail storm. Some of the land can be missed. 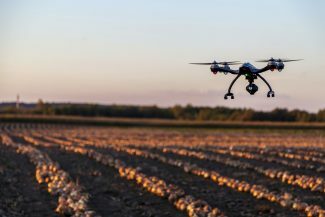 But with a drone, that can go out and take photographs of the field, farmers can get a better view of what parts of their fields were damaged. Arnie Fiscus is an alfalfa farmer and owns a cow/calf operation in the Fort Morgan and New Raymer area. He attended the drone session hoping to learn more. He said a drone could be useful in a cow/calf operation to give a better picture of the fencing, water and the overall view of what's happening.